I consider this the first, true classic of the series. It’s my 2nd all-time favorite and it holds a special place in my heart. I recall the preview (prior to the original airing), which showed the laser gun zapping the hunters’ car to flames. Looked like it was going to be way cool and certainly delivered. 40 years later, it’s still one of the best. A great sci-fi theme blended with a touching love story. Musically, this ep introduced the beautiful “Allen & Yvette” love theme, which was reused in later shows. Not sure if it was by Dominic Frontiere. May have been written by one of the other musical contributors. Regardless, it’s a memorable theme from the series. 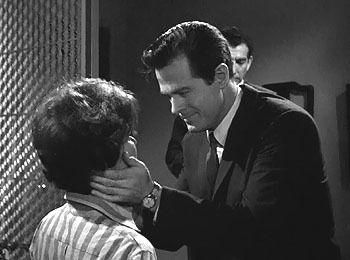 Robert Culp heads the excellent cast as Allen Leighton, the brave soul who selflessly sacrifices himself in the hope of making a better world (by agreeing to become something out of this world). It always moves me thinking of what he gave up, even beyond his own life. 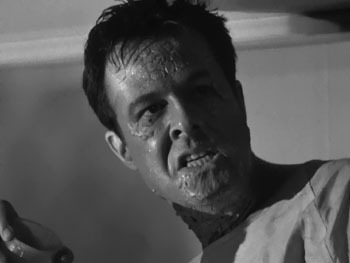 Culp is unforgettable here, and he will also return for 2 more OL’s down the road, “Corpus Earthling” and the classic “Demon With a Glass Hand” (season 2). Leonard Stone and Geraldine Brooks lend top support. (Look for Brooks in the William Shatner ep “Cold Hands, Warm Heart” – also season 2). And for a novelty, you can catch Stone in “Willy Wonka and the Chocolate Factory” of all things. During an interview, Robert Culp said they wanted to do something that hadn’t been done before [referring to the ep]. And they more than succeeded. The production is superb – tense and haunting. Quick shots of the more grotesque developments in Allen’s transformation are handled extremely well. When we see the Thetan more at length during the finale, it is an amazing, original creation. With veins on the scalp, twitching eyelids, bizarre legs and arms, it remains one of the best bears. 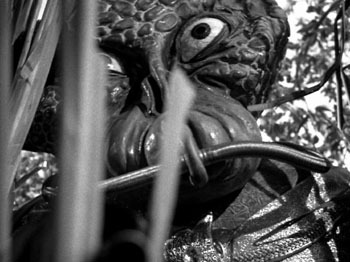 It was such an unusual creature back in 1963, that one or more stations actually blacked out the Thetan’s scenes during the original airing, fearing it was too disturbing. Luckily, that didn’t happen here in Philly. We got to see it complete - in all its glory!! Certain OL’s can literally move me to tears, and “Architects” gets me every time. Another reason this one’s so special to me is it’s one of 2 pre-recorded OL’s that my wonderful father bought me years ago, before he passed away. I’ll always think of that. Also, the music, story & acting just blow me away. When Allen (as the Thetan) signals to Yvette the mark against evil before succumbing, I start welling up. And when Yvette kneels down to caress her fallen soul-mate for the last time, it’s all I can do to keep from wailin like a baby! But hey, isn’t that what great art is all about? Just as a beautiful symphony, I can always count on this OL to touch an inner chord. Last edited by Lunkenstein on January 17th, 2006, 11:26 pm, edited 2 times in total. In watching the particular segment where the various scientists will "draw lots" to decide who will become the "Thetan," did you notice when Doctor Gainer takes a SPECIMEN from a CAGE? When I discussed that scene with some other fans at a convention, there was a big Disagreement as to what the caged-creature actually was. 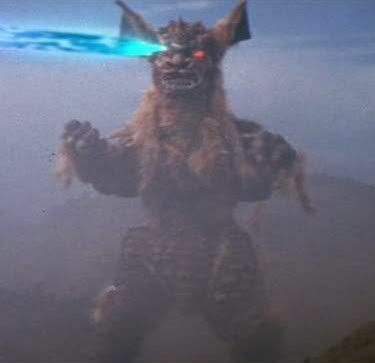 Some fans say that the creature was created by Earth-scientists as part of the deception. On the other hand, some other fans say that it's an actual alien from the planet Theta from whom the DNA was taken and then injected into Allen Leighton in order to transform Leighton into a Thetan. In other words, the similar technique used in another episode THE CHAMELEON where LOUIS MACE is transformed into an alien. In THE CHAMELEON episode, one of the aliens had inadvertently scraped off some of his skin on a soldier he had fought with, and it was from that skin that the scientists extracted DNA to use on Louis Mace to transform him into a similar alien. So was that done also with ARCHITECTS OF FEAR, that is, taking DNA from that creature in the cage? Or was the cage-creature a total deception too? What conclusion do you get from watching that scene? Interesting you should bring that up. When this ep was originally posted at the old Xenorama EzBoard, we had a similar discussion. I'd always assumed the scientists found a way to obtain a real Thetan, and that the race was naturally smaller than humans. Using it as a guide and for DNA/blood/genetic purposes to help transform Allen seemed logical. But one poster promoted the idea that it was originally a monkey, and the scientists tested their transformation process on it first. That also made sense after I thought about it. If you look at the way it moved and especially some of the sounds it made, the idea fits. At first they sound almost normal like little monkey chirps. Then they veer into a weird, distorted rattling whine which is really creepy. It gives me goose-bumps sometimes. Another example of excellent use of sound in the series. As to which theory the writers intended, I'm not sure now. But that is something I really love about the series - that everything is not automatically spelled out. Very cool - forcing the viewer to consider possibilities via slight ambiguity. 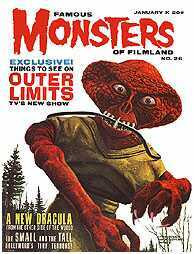 Lunkhead, it's too bad that you don't have David Schow's Outer Limits BOOK. Among the many gems in there is coverage of ARCHITECTS with a rare behind-the-scenes shot of stuntman Janos Prohaska practicing on stilts! That's right, STILTS,because if you look closely at the Thetan's legs, its structure is BACKWARD-JOINTED like a bird. So Prohaska had to walk on modified STILTS for the Thetan's legs. Very difficult balancing act not only because of the stilts but also because of the heavy alien TORSO and head. Just the head alone was Three times bigger than Prohaska's head. No wonder Prohaska was hired, because he was a Circus acrobat. The end-result was quite impressive with the Thetan having a loping-type walk like that of a Crow. An excellent example of the Outer Limits crew going that extra mile of hard work to make a memorable "bear." I really should get the Schow book at some point. Thanks for that info Preston. It's something to realize the creativity and effort they put into the episodes. The Thetan is one of my favorite OL bears. it's one of the shows i always wanted to see, but they never showed in CO (or at least never when i was around). a great monster!